Worksites, predominately in the fields of construction and mining ordinarily require an office on site. A common characteristic amongst sites is that they operate within limited space constraints and encounter recurring problems of inadequate space for their on-site offices. The solution to the problem is simple, a shipping container office! The versatility of your typical shipping container supports any modification desired to make it ideal for any worksite requirement. These container offices are not only adaptable but secure and durable. Built tough, these steel casings are made to withstand all the elements of harsh weather climates. While it is beneficial to keep the weather out, another primary concern is security. Your office is fully lockable and vandal-proof, with a guaranteed that your office valuables are safe and secure. For added assurance, the option of a fitted lockbox can be installed, offering protection for your padlock against tampering. The best part of a shipping container office is, it can be modified uniquely to your particular needs. As your comfort is a priority, the shipping container has extra modification options that include insulation fittings, ventilation, power outlets, lighting, windows, doors, shelving and air conditioning. Available in three size lengths, 10ft, 20ft, and 40ft, containers are spacious allowing for ample room for office furniture and desks. A shipping container office provides a cost effective alternative to building a conventional temporary office, especially if it’s only going to be used as a one-time purchase. Although it is important to note whilst shipping containers are relatively cheap to purchase, modification costs must also be taken into consideration of the final total. Although shipping containers are rigid in structure, they accommodate a large variance of flexibility for any desired layout and can suit any range of site. As your office site expands so too can your shipping container offices. Portable, modular units can facilitate your space constrictions with the ability to stack vertically on top of one another creating more office space and covering less land mass. Larger multiple-building offices can be constructed by aligning multiple containers side by side, for larger long-term project solutions. Due to their portability, once a project is completed, the container office can easily be transferred from one completed project to the next project for immediate use. 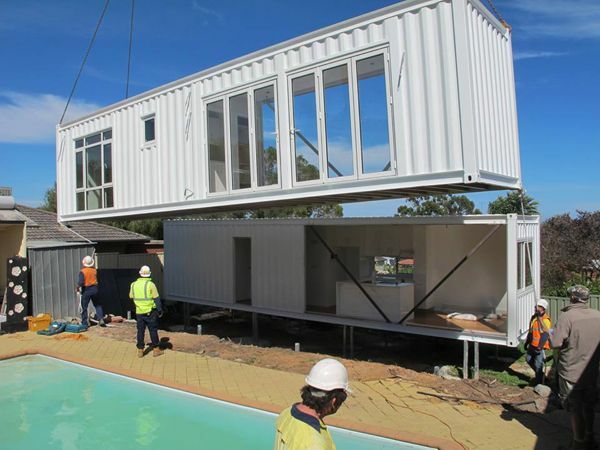 As a result of its portability, it is essential that each time a shipping container is relocated there is a pre-established level foundation in place to ensure stability and thus safety. Popular choices for shipping container foundations include concrete slabs, or footings made of either wood or concrete, all of which providing the same level of stability. If you’re interested in a shipping container make an enquiry here or if you wish to find out more about how we can modify a shipping container into your next office, talk to the friendly team at ANL Container Hire & Sales on 1300 284 896.